Input Voltage (recommended) : 7-12V. 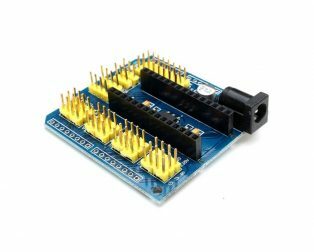 Digital I/O Pins : 14 (of which 6 provide PWM output). Analog Input Pins : 6. Purchase this product now and earn 5 Robu Points! 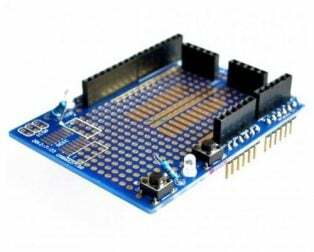 The Uno R3 with Cable is a micro-controller board base on the ATmega328 (datasheet). It has 14 digital input/output pins (of which 6 can be used as PWM outputs); 6 analog inputs, a 16 MHz ceramic resonator, a USB connection, a power jack, an ICSP header, and a reset button. 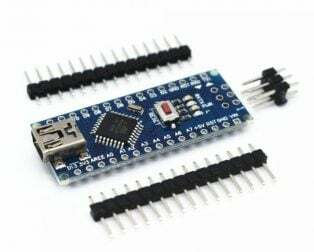 It contains everything need to support the microcontroller; simply connect it to a computer with a USB cable or power it with an AC-to-DC adapter or battery to get started. 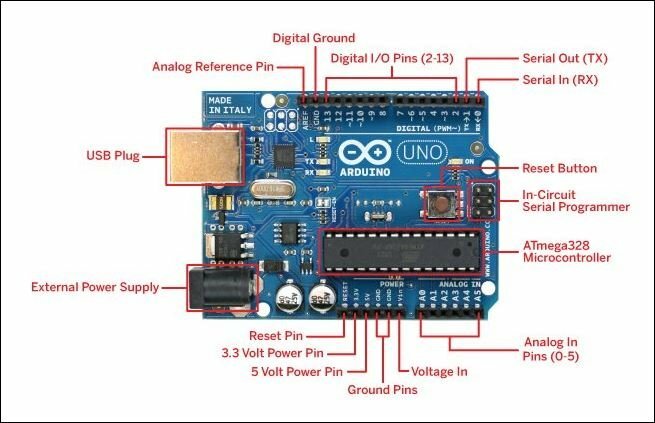 “Uno” means one in Italian and is the name to mark the upcoming release of Arduino 1.0. 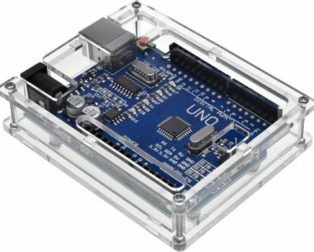 The Uno and version 1.0 will be the reference versions of Arduino, moving forward. 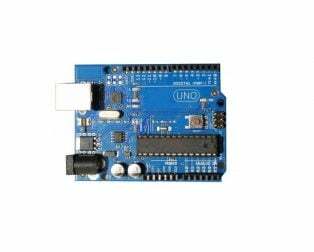 The Uno is the latest in a series of USB Arduino boards and the reference model for the Arduino platform; for a comparison with previous versions, see the index of Arduino boards. 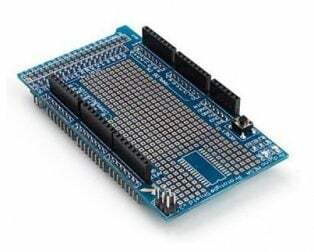 Note: The Uno R3 reference design can use an Atmega8, 168, or 328, Current models use an ATmega328, but an Atmega8 is shown in the schematic for reference. The pin configuration is identical on all three processors. The Uno R3 can be powered via the USB connection or with an external power supply. The power source is selected automatically. External (non-USB) power can come either from an AC-to-DC adapter (wall-wart) or battery. 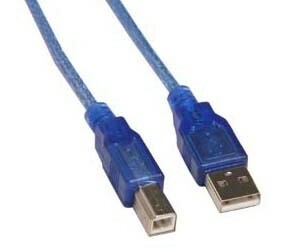 The adapter can be connected by plugging a 2.1mm center-positive plug into the board’s power jack. Leads from a battery can be inserted in the Gnd and Vin pin headers of the POWER connector. VIN. The input voltage to the Arduino board when it’s using an external power source (as opposed to 5 volts from the USB connection or another regulated power source). You can supply voltage through this pin, or, if supplying voltage via the power jack, access it through this pin. 5V.This pin outputs a regulated 5V from the regulator on the board. 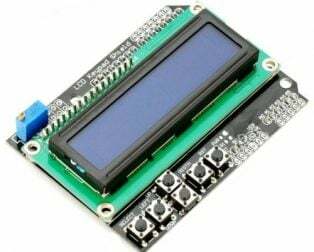 The board can be supplied with power either from the DC power jack (7 – 12V), the USB connector (5V), or the VIN pin of the board (7-12V). 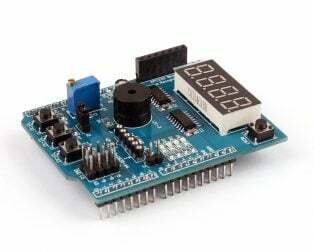 Supplying voltage via the 5V or 3.3V pins bypasses the regulator, and can damage your board. We don’t advise it. 3V3. A 3.3 volt supply generated by the onboard regulator. The maximum current draw is 50 mA. 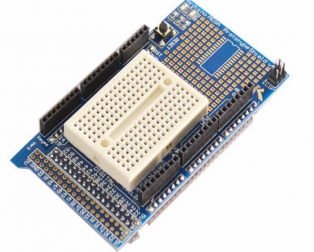 The ATmega328 has 32 KB (with 0.5 KB used for the bootloader). 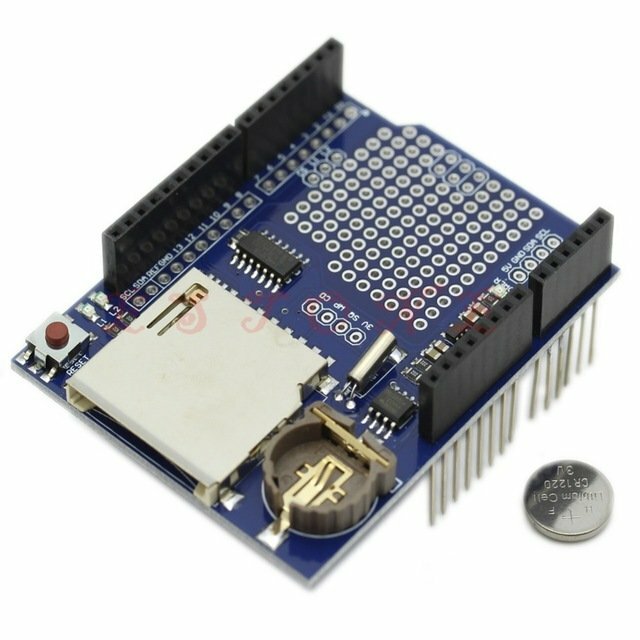 It also has 2 KB of SRAM and 1 KB of EEPROM (which can be read and written with the EEPROM library). External Interrupts 2 and 3. 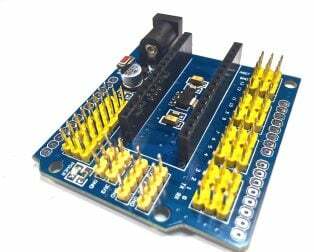 These pins can be configured to trigger an interrupt on a low value, a rising or falling edge, or a change in value. See the attachInterrupt() function for details. LED: 13. 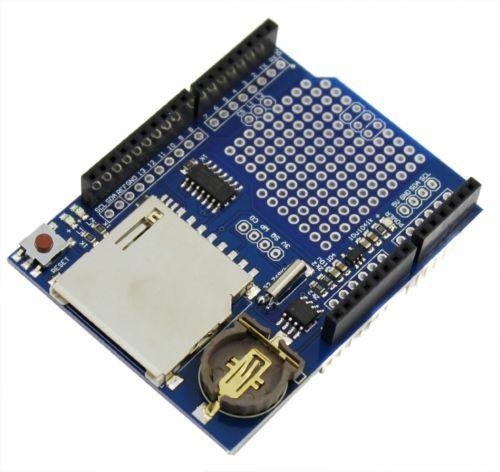 There is a built-in LED connected to digital pin 13. When the pin is HIGH value, the LED is on, when the pin is LOW, it’s off. AREF. A reference voltage for the analog inputs. Used with analogReference(). 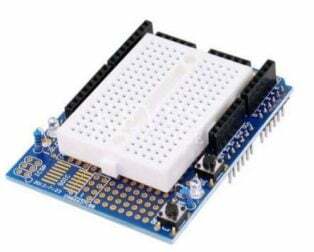 See also the mapping between Arduino pins and ATmega328 ports. The mapping for the Atmega8, 168, and 328 is identical. 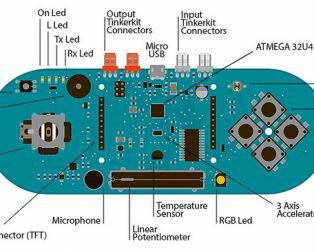 The Uno R3 has a number of facilities for communicating with a computer, another Arduino, or other microcontrollers. 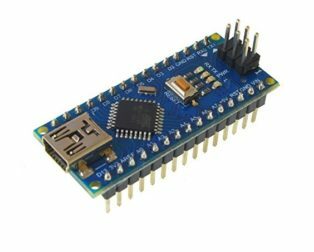 The ATmega328 provides UART TTL (5V) serial communication, which is available on digital pins 0 (RX) and 1 (TX). 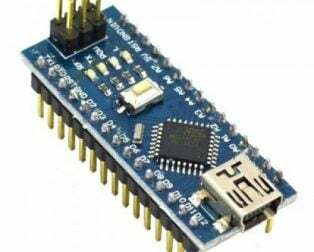 An ATmega16U2 on the board channels this serial communication over USB and appears as a virtual com port to software on the computer. 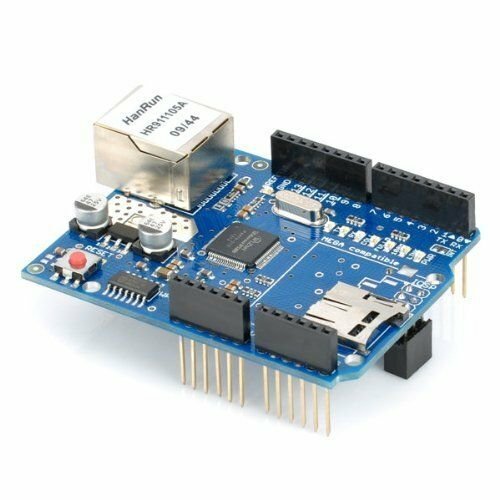 The ’16U2 firmware uses the standard USB COM drivers, and no external driver is needed. However, on Windows, a .inf file is required. 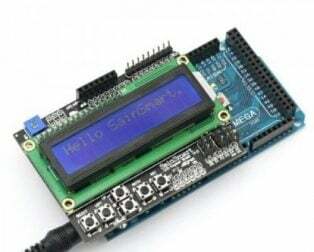 The Arduino software includes a serial monitor which allows simple textual data to be sent to and from the Arduino board. 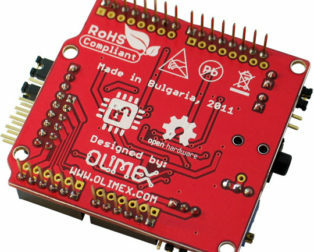 The RX and TX LEDs on the board will flash when data is being transmitted via the USB-to-serial chip and USB connection to the computer (but not for serial communication on pins 0 and 1). 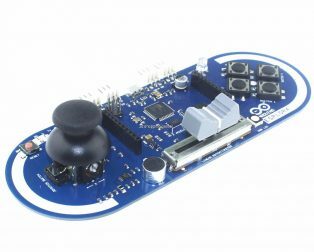 A SoftwareSerial library allows for serial communication on any of the Uno’s digital pins. 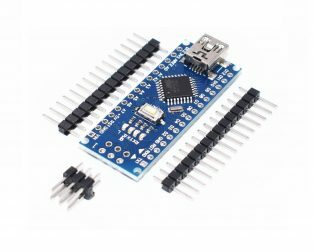 The ATmega328 also supports I2C (TWI) and SPI communication. The Uno R3 software includes a Wire library to simplify use of the I2C bus; see the documentation for details. For SPI communication, use the SPI library. 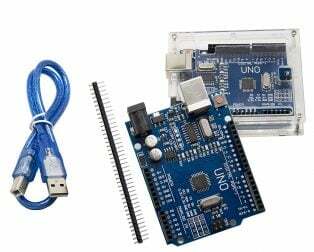 The Uno R3 can be a program with the Arduino software (download). 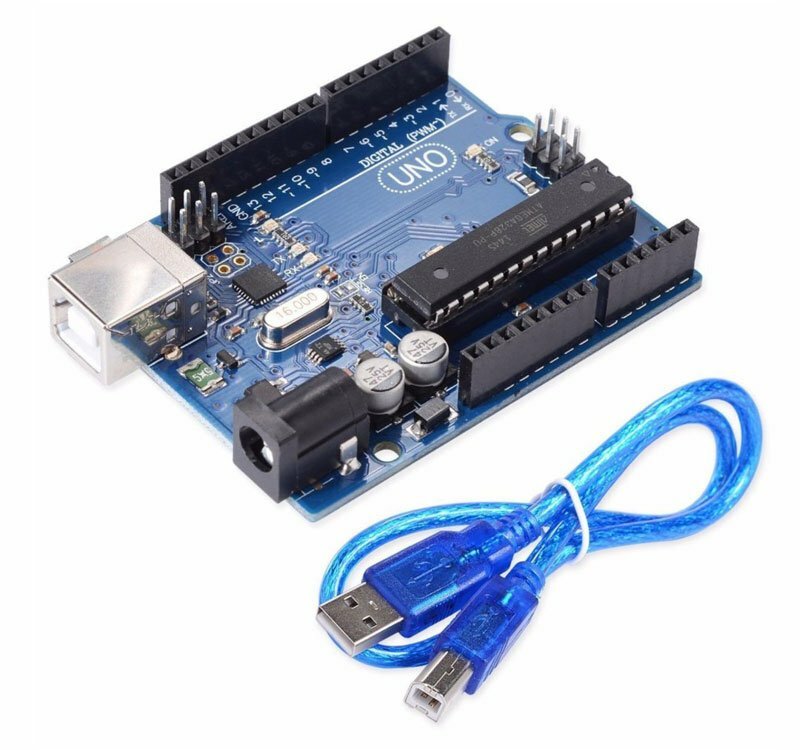 Select “Arduino Uno from the Tools > Board menu (according to the microcontroller on your board). For details, see the reference and tutorials. 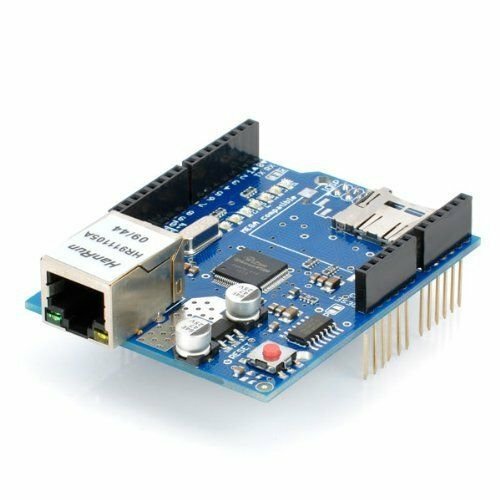 The ATmega328 on the Uno R3 comes pre-burn with a bootloader that allows you to upload new code to it without the use of an external hardware programmer. It communicates using the original STK500 protocol (reference, C header files). On Rev1 boards: connecting the solder jumper on the back of the board (near the map of Italy) and then resetting the 8U2. On Rev2 or later boards: there is a resistor that pulling the 8U2/16U2 HWB line to ground, making it easier to put into DFU mode. 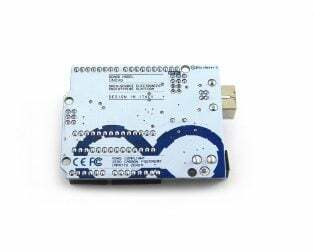 You can then use Atmel’s FLIP software (Windows) or the DFU programmer (Mac OS X and Linux) to load a new firmware. Or you can use the ISP header with an external programmer (overwriting the DFU bootloader). See this user-contributed tutorial for more information. Rather than requiring a physical press of the reset button before an upload, the Uno is designed in a way that allows it to be reset by software running on a connected computer. One of the hardware flow control lines (DTR) of theATmega8U2/16U2 is connected to the reset line of the ATmega328 via a 100 nano-farad capacitor. When this line is asserted (taken low), the reset line drops long enough to reset the chip. 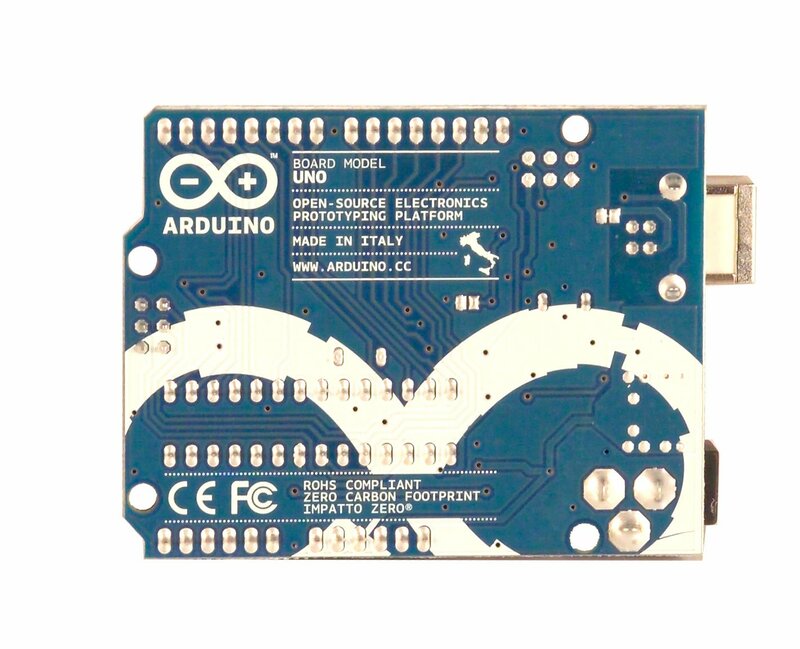 The Arduino software uses this capability to allow you to upload code by simply pressing the upload button in the Arduino environment. This means that the boot-loader can have a shorter timeout, as the lowering of DTR can be well-coordinated with the start of the upload. This setup has other implications. When the Uno is connected to either a computer running Mac OS X or Linux, it resets each time a connection is made to it from software (via USB). For the following half-second or so, the boot-loader is running on the Uno. While it is a program to ignore malformed data (i.e. anything besides an upload of new code), it will intercept the first few bytes of data sent to the board after a connection is open. If a sketch running on the board receives one-time configuration or other data when it first starts, makes sure that the software with which it communicates waits for a second after opening the connection and before sending this data. The Uno R3 contains a trace that can be cut to disable the auto-reset. The pads on either side of the trace can be soldered together to re-enable it. It’s label “RESET-EN”. You may also be able to disable the auto-reset by connecting a 110-ohm resistor from 5V to the reset line; see this forum thread for details. 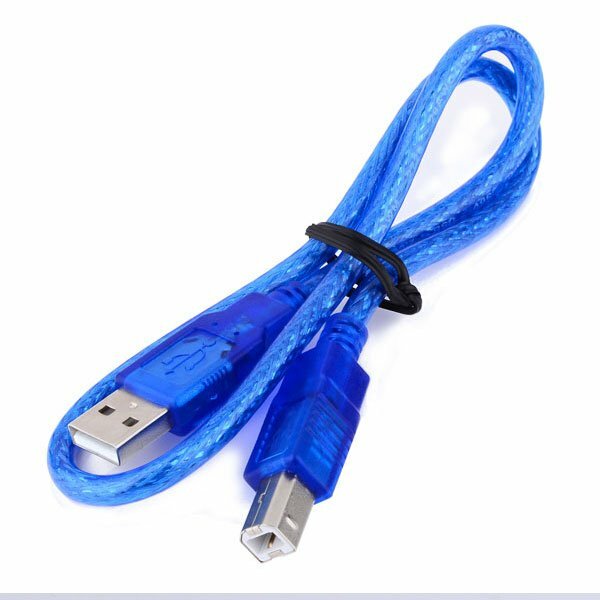 The Uno has a resettable polyfuse that protects your computer’s USB ports from shorts and overcurrent. Although most computers provide their own internal protection, the fuse provides an extra layer of protection. 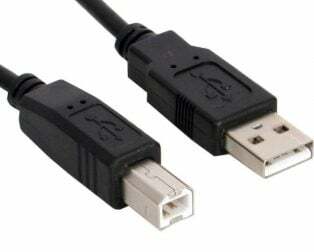 If more than 500 mA is applied to the USB port, the fuse will automatically break the connection until the short or overload is removed. 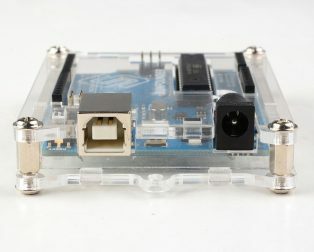 The maximum length and width of the Uno PCB are 2.7 and 2.1 inches respectively, with the USB connector and power jack extending beyond the former dimension. 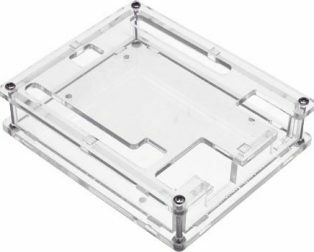 Four screw holes allow the board to be attached to a surface or case. Note that the distance between digital pins 7 and 8 is 160 mil (0.16″), not an even multiple of the 100 mil spacing of the other pins. 1.0 pinout: added SDA and SCL pins that are near to the AREF pin and two other new pins placed near to the RESET pin, the IOREF that allow the shields to adapt to the voltage provided from the board. 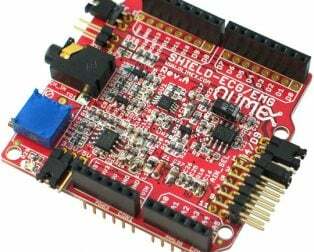 In future, shields will be compatible with both the board that uses the AVR, which operates with 5V and with the Arduino Due that operates with 3.3V. The second one is a not connected pin, that is the reserve for future purposes. splendid performance. in this price range, i got “made in italy” product. 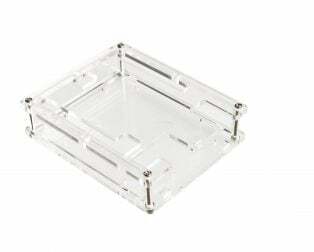 good quality product and quick delivery..
Good product with fast shipping…. 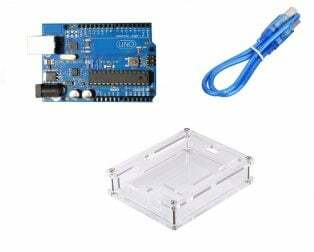 Good for starting Arduino project. Very good product. And very good service. Very good product. And very good service. Very versatile. Fantastic product. One, that I was looking for. It’s just a plug N play. Thanks. i’m thinking to buy it…..